This article is in response to a question I get asked, or see asked, just about every week. There are dozens of great answers out there but none seem to focus on the mechanics of actually drawing the lines and how that may affect your analysis. I began this article by grouping support, resistance and trend lines together because they are really just different versions of the same thing. The only real difference is that support and resistance lines are typically horizontal while trend lines are diagonal when presented on a chart. The method for drawing them is identical as is their basic use in trading. However, as I got into the nuts and bolts of the technique I decided it would be better to separate them into different articles. Why? Because although there some major similarities in the drawing of the lines the analysis can be much, much different. My rule for trading with trend lines is a variation of a rule I use with support/resistance and Fibonacci Retracements; prices reaching the trend line is not a signal, it is merely a time and place where a signal is more likely to happen. This is perhaps the first best question for this discussion. There are a lot of places where a trend line can be drawn from and they are all valid. This is what makes drawing truly effective lines a real challenge. Why? Because each place that you see to draw a line is also a place that someone else has seen. The strength of the line depends on how many other traders are using the same line. This is why I say the best place to draw a trend line is EVERYPLACE you see an opportunity for one. They will all give you a signal, of varying strength, and over time you will learn to recognize which ones are the most important. What do I mean? Look at the one year chart of the OEX presented below. I have marked several areas where a trend line could be started and/or anchored. Do you start it at the lowest or highest closing price or at the lowest or highest intraday price? Do you start it at the first bounce or the confirming bounce? 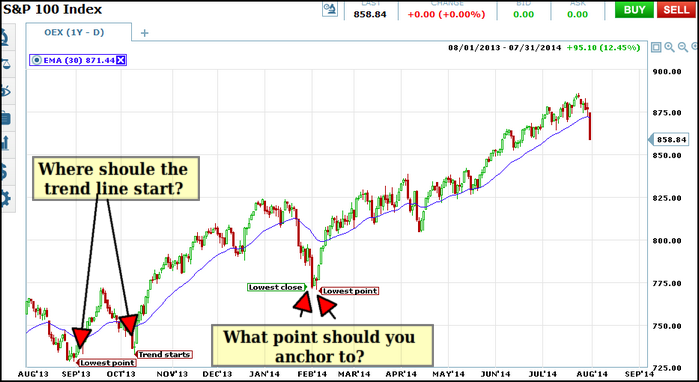 When you anchor the trend line the same questions apply. Do you anchor to the lowest or highest close, or the lowest or highest intraday price ie the tip of the candle wick. The answers you give will produce a very unique set of lines. Look at the chart below. I have drawn four trend lines with four different starting points and two different anchor points. For the start of the lines I used all four possible; the lowest close and the lowest point of the lowest point before the rally, and the lowest point and lowest close of the first bounce after hitting bottom. These four lines are all anchored to either the lowest close or lowest point of the next major dip in the index This has produced four similar, but very different, trend lines. Which one is the most important? All of them. If you look closely they form a band or zone that will likely produce a trend bounce once price action has reached it. To illustrate how a bundle of trend lines can affect stock prices I have redrawn my chart using the February 2014 bottom as a starting point. You can see that I used two different candles as starting points, both from the lowest point of the lower candle shadow. The lines both intersect with current price action but in a very interesting way. The two lines cross before price action meets up with trend and form a small channel. See how prices come down and stop right at the upper trendline and then on the very next day a new, smaller, candle forms at the lower line, exactly in between the two trend lines. I think by now you can begin to see how both trend lines are important and both are affecting prices. Together the two lines form a zone of support that will be stronger than either two lines alone. This is why it so important to use other indicators in conjunction with trend lines. 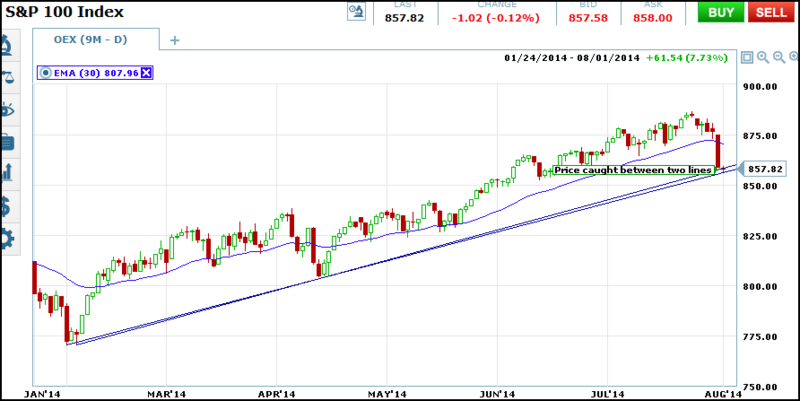 The trend line itself is not always a great signal for entry where as price action around the trend line is. Just like with Fibonacci Retracements, the trend line is not a signal but a place where a signal is most likely to form. 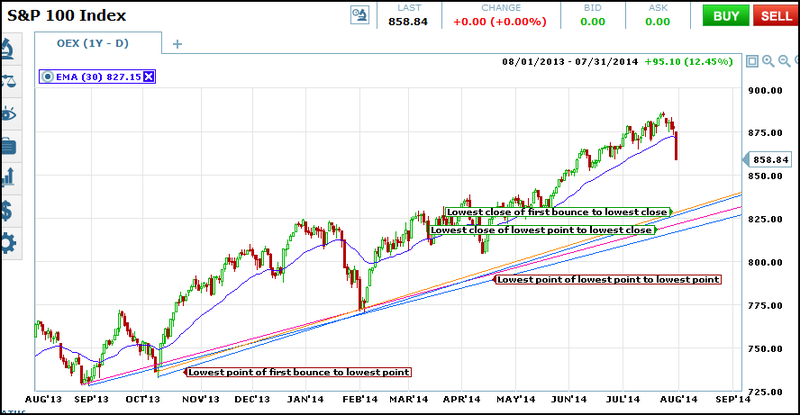 Either in line with the underlying trend, the market is in agreement, or against it.